One of the great things about pop up campers is that they’re typically much less expensive than bigger travel trailers. A lot of them are inexpensive enough that it isn’t unheard of to make an all-cash offer on a brand new tent trailer or a-frame, and used pop up campers tend to be even more affordable. However, financing is always an option as well. If you are thinking about financing your next pop up camper purchase, then an RV loan calculator can help you figure out how much you can afford to spend. After you have input all of your custom values into our RV loan calculator, you will need to click the “calculate” button. That will trigger a pop-up overlay that contains some useful information. The most important number that you see will be your monthly payment. This is the amount of money that you will be responsible for paying each month during the entire term of the loan, so you can use it to effectively budget your pop up camper purchase. This number can also be used, along with your existing debt-to-income ratio (and your credit rating), to determine how big of a loan you can qualify for. If the monthly payment is too large, or you think that you can afford a higher monthly payment, you can play around with the loan amount, down payment, interest rate, and loan term to see what might better fit your situation. Our RV loan calculator provides some useful numbers that can help you plan a purchase. In addition to the estimated monthly payment, you will also see the total amount that you would owe over the term of the loan, the total interest you would pay, and the payoff date based on the origination date that you put in. These numbers will all vary depending on the initial values that you put into the calculator, so you can easily see how they change based on the interest rate, down payment, and other factors. 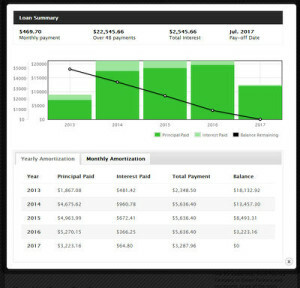 The results screen of our RV loan calculator also includes a bar graph that provides you with a visual representation of your loan. The graph shows how much interest and principal you would pay each year, and it also includes a line graph that shows the incremental decrease in the amount that you would owe each year. That gives you an idea of how much it would cost to pay off your loan early. The default results screen also shows the amortization of your loan on a yearly basis, although you can also choose to look at the monthly numbers if you prefer. Different lenders have different policies, but most lenders look for a debt-to-income ratio that is somewhere between 40 and 50 percent. If your RV loan payment won’t put you outside that range, and you have a decent credit score, then you have a better chance of securing the RV loan that you’re looking for. If you have more questions about determining how much you can afford to spend each month on an RV payment, or how to budget for this type of purchase, organizations like the National Foundation for Credit Counseling provide a lot of helpful resources. Our RV loan calculator is provided purely for informational purposes, and we hope that it will help you get a better idea of how much you can afford to spend on a new pop up camper. This is just one of the tools we provide at popupcampers.us to help prospective buyers learn about pop up campers without any influence from any particular manufacturer or dealer. Popupcampers.us isn’t a lender, a dealer, or a broker, and all information on this site is purely informational in nature.